I recieved this book free from Netgalley.com for review purposes. I literally just finished this book, in a day mind you, and immediately had to come tell you guys about it. I don’t want to give too much away like I do in my normal reviews, mainly because this book is not yet in publication. Starting off, the main reason I wanted this book was the cover. I mean..look at it. It’s gorgeous. Then the description sounded amazing. So you can imagine how pleased I was when I found out I was indeed able to get it. The book starts off with Madeline explaining about her life and what is going on. And you feel so sad for her. Stuck in a house her whole life because she has the bubble boy, in this case girl, disease SCID. I literally cannot imagine what that would be like. Then this family moves in next door, and she sees Olly. And Olly sees her. As time moves on they start IMing, because she isn’t allowed a phone. Her nurse allows, without her mother knowing, this boy to come and visit Madeline, or Maddy as Olly calls her. Of course, he has to go through an hour decontamination process. Her nurse does this every day. They do things she shouldn’t. Like hold hands. And kiss. And fall in love. One night Olly and his father get into a fight, and Olly gets hurt. Maddy without thinking leaves the house. Her mother says she’s lucky she didn’t get sick. And then gets grounded. At this point my little heart is aching for the love that is blooming between these two. And SO glad she did not get sick. A little later on Maddy decides she is SICK AND TIRED of just staying in that house and not living anymore. So she buys plane tickets and book a hotel room for her and Olly. They go. She gets sick. VERY SICK. But lives. She also gets an Email from a Dr. that treated her in Maui, saying what I had been thinking the whole book. I won’t say this part. But it’s good. That’s actually where I am going to end the little synopsis that I do and just..say my feelings about Everything, Everything. I had read a few reviews before starting the book, and I thought I was going to be disappointed. I was not. The chapters were written in short little bursts. Which makes sense to me, since it is an 18 year old girl writing the “story”. Thoughts are hard for me to form sometimes, at least the way I want them to. The whole book I had this sense of dread like something terrible was going to happen…and usually I am right about them. Not this time. 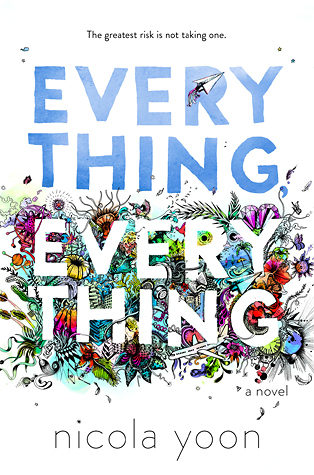 This entry was posted in Book, Book Review and tagged book, book review, book reviewer, books, death, doctor, dr, dying, everything, everything everything, love, lying, netgalley, nicola yoon, nurse, random house, review, reviewer, romance, scid. Bookmark the permalink. I can’t wait until it comes out to buy it. This is a book I need on my bookcase.